Do you have unsightly veins on your legs? Are you experiencing unexplained leg pain? You could be one of the 25 million people in the United States suffering from a variety of varicose vein symptoms. Venous insufficiency and venous reflux may be associated with common symptoms of varicose veins, which include tender, enlarged veins, swollen legs, skin discoloration, restless legs, muscle cramps, aching legs, and in extreme cases, skin ulcerations and blood clots. The reason you have these symptoms is because of Venous Reflux (Venous Insufficiency). Venous reflux is a medical condition where blood within the veins no longer flows in one direction, against gravity, towards the heart. Venous reflux occurs when the one-way valves and vein walls become damaged or weakened allowing blood to flow the reverse direction back towards the ankle and feet. Over time this causes pressure to build within the veins causing symptoms such as: varicose veins, leg and ankle swelling, leg pain, night cramps, restless legs, and many other symptoms that can ultimately lead to skin breakdown, skin darkening or ulcers/wounds on the legs. Venous reflux is a progressive disease that gets worse over time if left untreated. With the added pressure in the lower leg veins, small blood cells can leak out of the vessel wall and become deposited in the tissues causing the skin to appear discolored. As these blood cells break down and are absorbed, the pigment remains in the tissues, usually leading to permanent skin discoloration. The discoloration will continue to grow on your leg if the venous reflux is not treated. Blood clots may also form in the varicose veins due to the disordered and turbulent flow in these larger than normal, twisted veins. Stagnant blood flow, from the venous reflux, can cause the formation of blood clots which often remain superficial, but can extend into the deep veins leading to more dangerous DVTs (deep vein thromboses). While women are most commonly affected, men comprise about 20% of varicose vein patients. You may have a higher varicose vein risk if you suffer from one or more of the common leg symptoms associated with venous reflux. Once your medical exam and ultrasound is complete, Dr. Eidson will discuss with you all findings and personalized treatment options, including possible risks and benefits, and answer any questions you may have. For more information on the different types of treatment plans, please go to our Treatment Options tab on the stop of the website, or keep scrolling down for treatment options. If required, prior authorization from your insurance company will be obtained before any treatment is performed. We will also call your insurance company and get an updated estimate of your out of pocket expenses. We don’t like surprises and we try to do everything in our power to prevent any financial surprises. Prior authorizations from your insurance for your treatment can take 3 days to 6 weeks depending on your insurance carrier. Your recommended/approved treatments are then scheduled. After treatment, we will schedule a 1 week and a 6 week ultrasound after your last treatment. These follow up ultrasounds are extremely important. This helps us ensure that you are getting the best possible results from your treatment. We are ensuring that the veins we treated are closed properly and we are also checking for blood clots and more. It is very important that these 2 ultrasound follow up appointments are not missed. The reason we are firm on these ultrasounds is because if there is something that is not right, we can address it sooner rather than later. Every patient gets a post treatment instructions form to refer back to after treatment. You will also get Dr. Eidson’s direct phone number. If you feel like you might have a problem that needs to be addressed immediately, that number is there. We encourage people not to feel bad about calling that number, especially on weekends or at night. If you have a problem, we need to know about it as soon as possible. We want to take care of you and give you the best care you deserve. 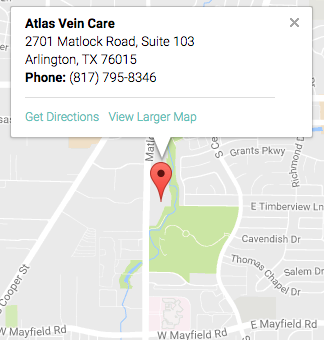 All of our vein treatments are always performed in our office and always by a doctor who is a certified Vein Specialist. This Radiofrequency Ablation vein treatment is covered by most insurance companies, including Medicare and TriCare. How is the treatment done? The doctor will numb the skin surrounding the vein that we will be treating in your leg. We are not stingy when it comes to numbing medicine! Then, through a small nick in the skin, an FDA approved catheter (ClosureFAST®) is inserted into the vein. This catheter is used to close the malfunctioning problematic vein. What does it do? The catheter uses heat to close the vein. The vein will start to spasm once the heat is applied and the vein will say “I don’t like it” and the vein will literally close and collapse after the treatment. You should not feel the treatment because of the numbing medicine. Once this heat energy is delivered to the vein, it is sealed shut. The result mimics that of Endovenous Laser Ablation because it closes down the problematic vein. What happens to that vein after we close it? The body will, over time, absorb that vein back in the body, and it should not come back. That vein should be closed for good. Well, what happens to the blood that was going through that vein? It gets rerouted to nearby healthy veins. You have a lot of veins in your legs that can easily take over the blood flow from the malfunctioning vein. Think of it this way, your problematic vein wasn’t helping you. It was hurting you. It was causing life limiting, sometimes debilitating, symptoms. We then fix the veins and your symptoms improve, or better yet, are gone completely. These treatments usually take about 30-45 minutes to complete with success rates greater than 95% and very low recurrence rates. The VenaSeal™ treatment is the latest and most advanced option to treat vein problems in the legs. Much like the above treatment using Radiofrequency Ablation, VenaSeal™ also closes the malfunctioning vein but instead of using heat energy, it uses patented medical adhesive “glue” to close the vein. It delivers a small amount of a specially formulated medical adhesive inside the problematic vein. The adhesive seals the vein shut immediately and the blood is rerouted though nearby healthy veins. You will leave with only a bandaid and you do not need to wear compression socks or wraps after your procedure. Currently, the VenaSeal procedure is NOT covered by any insurance companies. If you are interested in this treatment, we recommend you schedule a consultation with our doctor to talk about the differences and benefits in more detail. This treatment is for malfunctioning veins that are too small to be safely treated with Radiofrequency Ablation or VenaSeal. Under ultrasound we can see these small veins and we inject them with a medicine that causes the vein to spasm and then collapse and seal shut. This treatment is often used in conjunction with the other vein treatments to get a more effective result. That’s why this is called a “chemical ablation” or the technical term “sclerotherapy.” This treatment is covered by most insurance companies including Medicare and TriCare. Also referred to as Ambulatory Phlebectomy, a Microphlebectomy is a safe and effective in-office procedure that is used to remove varicose veins through tiny incisions using local anesthetic. These incisions are so small that no sutures or stiches are required! This is not “vein stripping” even though we are physically removing varicose veins. Once removed, these varicose veins are likely to never return. The advantage of microphlebectomy is that it is often a “one-and-done” procedure. Microphlebectomy is recommended for the treatment of larger varicose veins and is often used in conjunction with endovenous thermal ablation or sclerotherapy, resulting in more efficient treatment. This treatment is covered by most insurance companies including Medicare and TriCare IF you are experiencing medical symptoms along with your varicose veins. If you simply “don’t like how they look” and you have varicose veins, they can be considered “cosmetic only” and might not be covered by insurance. Please contact our office if you are unsure if your varicose veins are a medical or a cosmetic concern. Most of the time, these varicose veins are a medical condition that is covered by most insurance companies. All visible veins are not “just cosmetic” concerns.